Teriyaki chicken used to be the only thing I ate at Japanese restaurants. My dad tried to get me to eat sashimi, but as a 7-year-old, raw fish kind of grossed me out. I got over that pretty quickly though and raw fish is now one of my favourite foods. I still, however, hold a soft spot in my heart for chicken teriyaki. Crispy chicken skin, glossy sweet sauce and fluffy white rice – there’s a comfort food meal right there. The funny thing about teriyaki is: even though you see bottles of teriyaki sauce at grocery stores in the rest of the world, teriyaki sauce is not actually sold pre-made in Japan. “Teriyaki” refers to a cooking method – the word comes from teri, meaning shiny, and yaki, meaning grilled. In essence, because I didn’t grill this chicken, it’s not technically teriyaki. It is, however, super delicious and quite easy. The next time you’ve got a teriyaki chicken craving, give it a try at home – kind of sort of how people in Japan do! Combine the soy, mirin, sake, and sugar in a small pot and bring to a boil. In a small bowl, whisk the cornstarch and water (if using) into a slurry and then whisk into sauce. Reduce until desired thickness. Taste and adjust for seasoning if needed. 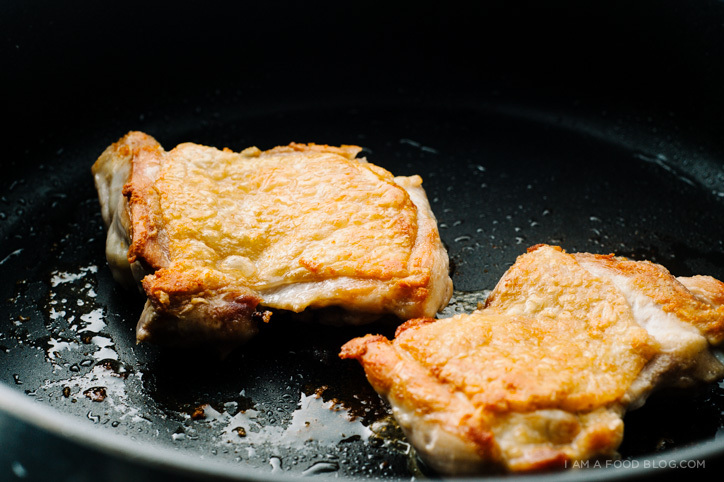 Cook the thighs in a dry pan (the chicken will render out enough fat that you don’t need to add any extra) skin side down, over medium-heat until the skin is brown and crispy, about 15-20 minutes. Flip and cook the other side for 5 minutes and check to make sure the chicken is cooked through. Rest on a cutting board for five minutes, then slice into strips and serve with teriyaki sauce with rice, cucumbers, green onions and toasted sesame seeds. You can cook the chicken and the sauce in one pan. Cook the thighs, in a dry pan, over medium heat until the skin is brown and crispy, about 15-20 minutes. Drain off any excess fat and then flip the chicken. Add 1 tablespoon each of soy, mirin, sake and sugar to the pan and turn the heat to medium high. The sauce should bubble, boil and thicken. Flip the chicken to coat in sauce. When the sauce has thickened to your liking, remove from the heat and serve. 1. The first method, where you cook the sauce and chicken separately, will result in a crispier chicken. 2. 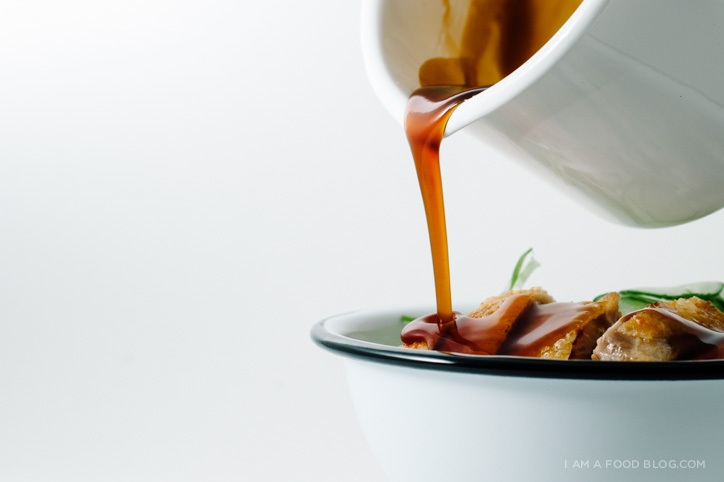 You don’t need to add cornstarch to your teriyaki sauce – it does however, speed up the reduction time and gives you that sort of thick, glossy sauce that most North Americans associate with teriyaki. 3. Teriyaki isn’t a sauce at all. It’s a cooking method: grilled meat that’s been glazed with soy, sake, mirin and sugar. 4. You can substitute white wine for the sake, but sake is readily available at most grocery/liquor stores. Same with mirin – it’s found in the Asian aisle. PS – If you like this recipe, you can order my cookbook, Easy Gourmet! Everything is always so perfect when you make it! 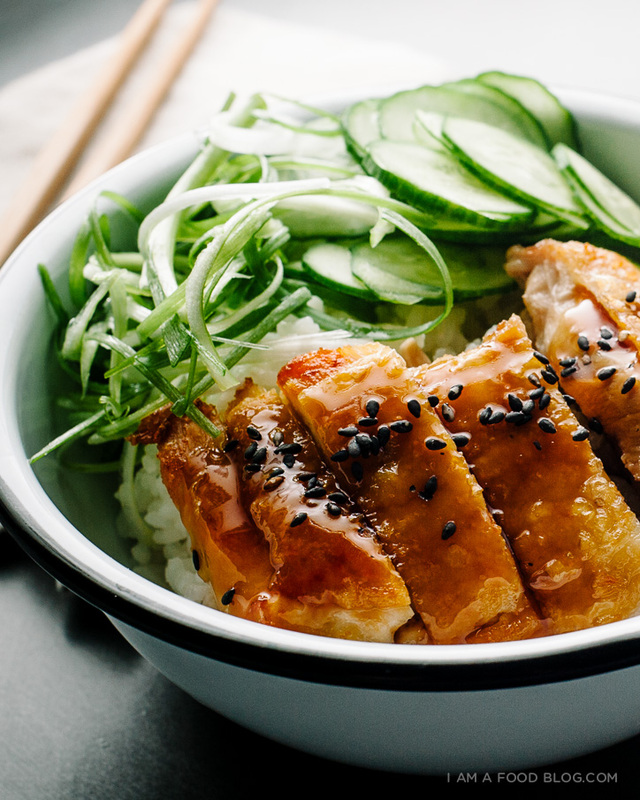 I haven’t had chicken teriyaki in years but this makes me want to make it! Absolutely awesome. I seriously could live on this chicken. Loving your pics! others. I love your blog! another awesome looking chicken recipe i am SO trying, bud! totally one of my comfort foods too. my DANGER food, however, is chicken karaage… or any fried chicken… hehe! Man the black sesame seeds really up that teriyaki chicken game – still lovin’ your food styling ways! Thanks so much for this. It’s stupid, I know, but I had no idea that you could make your own teriyaki sauce. That crispy skin is REALLY calling my name! I am also going to do baby back pork ribs with steamed cabbage!!! love teriyaki chicken! This looks so delicious! 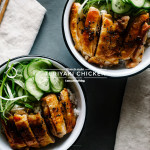 I’ve been craving good teriyaki chicken – thanks for the recipe. I love your blog by the way. Your photography is incredible. Can you use chicken breasts for these and would you cook it the same way? Just discovered your blog– love it! Depends on if you’re using skin on or off breasts. I’d recommend skin on – but they don’t need as long to cook as thighs and they have a tendency to dry out if you’re not keeping your eye on them. What you could do with breast is poach them, shred them and then put the sauce on top. Hope that helps! I JUST LOVE YOUR BLOG! I FOLLOW IT SINCE A YEAR NOW. TERIYAKI SAUCE ARE SOLD HERE IN INDIA TOO BUT THE ONES I ATE IN AUTHENTIC ASIAN RESTAURANTS ARE TOTALLY DIFFERENT THEN THE ONE COOKED USING THE BOTTLED SAUCE AVAILABLE IN THE MARKET. I’D TRIED TO COOK MANY RECEPIES FROM YOUR BLOG BUT UNFORTUNATELY NOT ALL SAUCES OR VEGES THAT YOU USE ARE MOSTLY AVAILABLE HERE. I’D REALLY LOVE TO SEE IF U PUT UP SOME MORE SIMPLIFIED GOURMETS USING VEGES THAT ARE GLOBALLY EASILY AVAILABLE. i’ve made this recipe and my family LOVES it! When do you add the sugar to the sauce? Whoops! You add it at the beginning. I’ve updated the recipe! Thanks! Hi! What a lovely blog you have. Wonderful pictures and tastier food! I was wondering though – what rice did you use for this recipe? Japanese rice or regular grained ones? i used koshihikari, a japanese short grain rice. 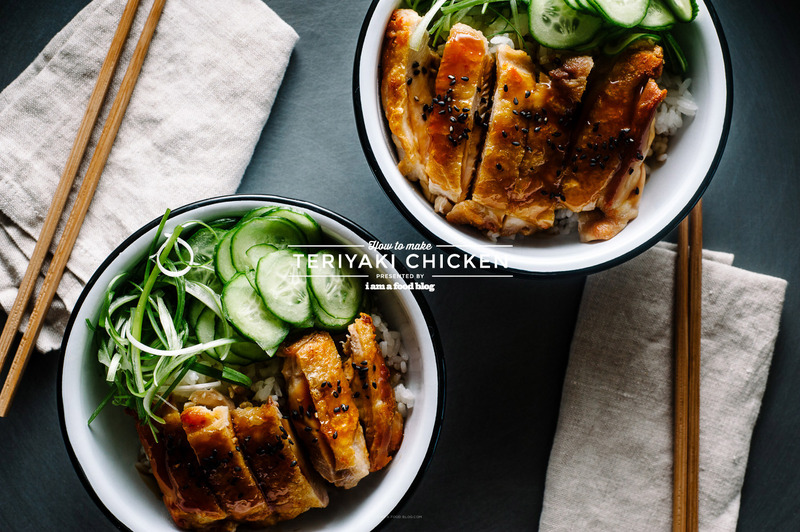 I love the images here in this page for the teriyaki, really good, the sauce being poured and the top header image I particularly like. You have done an amazing job there and very appetizing!